NMSDC Interim President Louis Green (left) and Chemico Group President and CEO Leon C. Richardson (right). Courtesy of NMSDC. "I am proud and humbled to be recognized by NMSDC for our efforts in advancing supplier diversity," said Leon C. Richardson, President and CEO of the Chemico Group. "The MBE of the Year award is a testament to our unwavering commitment to promote minority businesses." Chemico Group, the largest veteran and minority-owned chemical management supplier, received the Minority Business Enterprise (MBE) of the Year Award from the National Minority Supplier Development Council (NMSDC) during its 2018 Leadership Awards event held May 24th. 2018 marks the first time Chemico received this accolade. More than 1200 industry leaders gathered in New York City to celebrate and honor minority business visionaries who have made the biggest impact in growing and sustaining minority businesses over the past year. The MBE of the Year Award is presented to the owner of an NMSDC-certified minority business enterprise who has been actively engaged within the NMSDC network for a minimum of two years. The up and coming or seasoned recipient demonstrates exceptional leadership, is paving the way for other MBEs, is fully committed to minority supplier development and supporting the NMSDC network. "I am proud and humbled to be recognized by NMSDC for our efforts in advancing supplier diversity," said Leon C. Richardson, President and CEO of the Chemico Group. "The MBE of the Year award is a testament to our unwavering commitment to promote minority businesses. In my role as Chairman for the Michigan Minority Supplier Development Council’s (MMSDC) Minority Business Enterprise Input Committee (MBEIC), I have the privilege to work with nearly 1,250 small and large minority business owners in Michigan. I am privileged to do what I’m most passionate about -- mentoring other MBE’s and developing future leaders and entrepreneurs." “Leaders such as Leon Richardson and the Chemico Group embody the overall mission of the NMSDC. We honor those leaders that advocate for the value that minority businesses bring to the global corporate supply chain, and for the vital role they play I our nation’s economic growth and future,” Louis Green, NMSDC interim president. Chemico has received several awards from automotive manufacturers including: Superior Award for Distributors from Toyota Motor North America; General Motors’ Supplier of the Year recognition for seven consecutive years; and Fiat Chrysler Automobiles (FCA) Supplier Diversity Award. The company previously received the Diamond Award, Board of Directors Award and the prestigious Supplier of the Year Award for its category from the NMSDC. 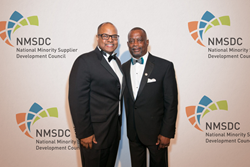 About NMSDC: The National Minority Supplier Development Council advances business opportunities for certified minority business enterprises and connects them to corporate members. One of the country’s leading corporate membership organizations, NMSDC was chartered in 1972 to provide increased procurement and business opportunities for minority businesses of all sizes. The NMSDC Network includes a National Office in New York and 23 affiliate regional councils across the country. The network also includes five international partner organizations located in the United Kingdom, Canada, Australia, China and South Africa. To meet the growing need for supplier diversity, NMSDC matches its more than 12,000 certified minority-owned businesses to our network of more than 1,750 corporate members who wish to purchase their products, services and solutions. NMSDC, a unique and specialized player in the field of minority business enterprise, is proud of its unwavering commitment to advance Asian, Black, Hispanic and Native American suppliers in a globalized corporate supply chain. For more information, visit http://www.NMSDC.org. About Chemico: Chemico Group is an ISO-9001 and 14001 certified chemical management supplier specializing in integrated solutions for the entire chemical lifecycle — from procurement to on-site inventory management, distribution to environmentally conscious disposal. Founded in 1989, the veteran and minority-owned company has three business lines that provide chemical management services, coatings removal and paint maintenance and industrial supply solutions. Chemico generates more than $120+ million in annual sales and has experienced growth every year since inception. Its customers span across a variety of industries including automotive, aerospace, electronics and healthcare. With more than 400 employees and 10 facilities in North America, Chemico is expanding services to Europe and South America. For more information, visit https://thechemicogroup.com.